I met Harrison Huxster at VegFest and loved that his aim was to use his merchandise to influence others through thought provoking messages. Here's some information about his company, Vegan Deviant. Vegan Deviant is an ethical and fair trade clothing brand with a few accessories available as well. 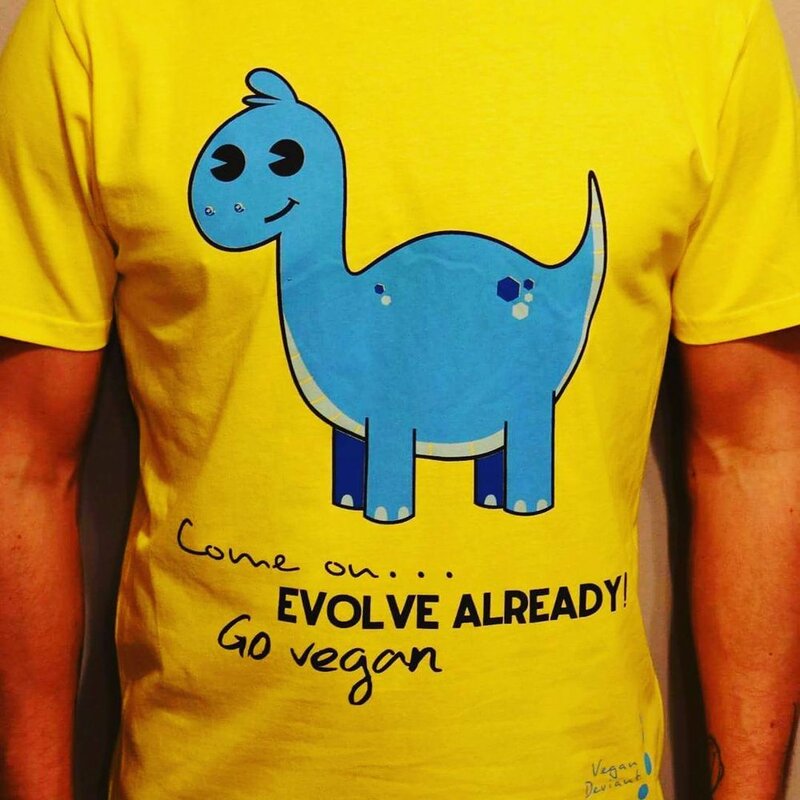 They showcase positive, thought provoking or humorous vegan messages and designs. We are an independent online London based company and frequently visit various vegan fayres around the UK with our products. I started the company because, after turning vegan I was haunted by feeling guilty about not making the change earlier on. This compelled me to find a way to make a positive impact to the already, and potential, vegan community. The best way I thought I could go about doing this, was to create a clothing brand that would encourage non-vegans to ask questions when they read the messages on my merchandise. Humour is a great way to bring something up whilst keeping things lighthearted. However, we know that some customers want an obvious, and more serious message, so we have catered for them too. I am originally from Guernsey and I moved to London 4 years ago. Previously I lived in Australia for 1 year, whilst travelling, and I lived in South America for a few months too. I particularly enjoyed living in the Amazon Rain forest in Bolivia, where I was a volunteer at an animal refuge. For over 10 years, I have supported people with learning disabilities in a variety of settings. I am a part time project manager for a charity that helps people with learning disabilities find, and maintain, employment. Recently, I began another part-time role, as the regional sports coordinator for London, which involves designing and implementing accessible sporting activities for people with duel sensory impairments. My vision for the future of Vegan Deviant is that it will grow as a company and allow expansion into other vegan projects, growing to a stage where we can offer a percentage of our income to support various animal sanctuaries. I want the company to be recognised for the messages we share, the beliefs that we stand for, and the campaings that we support.